Department of Biochemistry, Federal University of Technology, Owerri, NIGERIA. Department of Biochemistry, Imo State University, Owerri, NIGERIA. Herbal remedies offer another strategy for alleviation of co-existing liver and kidney pathologic conditions. The present study ascertained the functional integrity of hepatic and renal tissues, concurrently with blood lipid patterns, of Wistar rats infused with CCl4 and treated with raw and hydrothermal processed herbs, namely, Monodora myristica, Chromolaena odorata, Buccholzia coriacea and Sphenostylis stenocarpa. Measurement of phytochemical contents of the herbs was according to standard methods. The rats were randomly designated on the basis of diets and treatments received for 28 consecutive days. Fibrosis was induced in the Wistar rats by single dose intra-peritoneal injection of CCl4 for 2 consecutive days. Liver and kidney function tests and serum lipid profile were measured using spectrophotometric methods. Renal and hepatic tissues were subjected to histopathological examinations. The concentrations of alkaloids in the four herbal extracts were within the range of 4.83 ± 0.03 – 31.33 ± 0.29 mg/100 g sample, whereas the concentrations of saponins varied within a relatively narrow range: 0.33 ± 0.09 – 4.33 ± 0.02 mg/100 g dry sample; p > 0.05. The activity ratios of AST to ALT of the rat groups were generally less than 1.0 unit. Atherogenic indices of fibrotic rats were within the following ranges: TAG/HDL-C ratio (3.59 ± 0.03 – 6.76 ± 0.06), TC/HDL-C ratio (3.72 ± 0.02 – 6.94 ± 0.05) and LDL-C/HDL-C ratio (2.00 ± 0.01 – 4.59 ± 0.02). Losses in phytochemical contents following hydrothermal processing of the herbs did not substantially affect their overall therapeutic scores against morphological and functional impairments of hepatic and renal tissues following CCl4 intoxication of the rats. Herbal extracts have been reported to ameliorate hepatic and renal disorders in humans and animal models.2,9,13,15 There is a vast array of Nigerian indigenous medicinal plants that are used for the treatment and management of pathologic conditions linked with overwhelming levels of reactive metabolic radicals.16,17 Monodora myristica, also called calabash Nutmeg, is an edible plant of the Annonaceae family. Phytochemical screening showed that the plant is rich in flavonoids, saponins and sterols but with minimal anti-nutrients such as cyanogenic glycosides, tannins, oxalates and phytates.18 The medicinal usefulness of M. myristica has been reported elsewhere.19,20,21,22 Chromolaena odorata (Linn) is commonly referred to as Siam weed, ‘Elizabeth,’ ‘Independence leaf,’ whereas in South-Eastern Nigeria, it is called ‘Enugu plantation weed’ and ‘Awolowo’,23 The proximate composition and phytochemical contents as well as the medicinal usefulness of the herb have been reported elsewhere.23,24,25,26 Buccholzia coriacea, commonly called ‘Wonderful Kola’, is frequently used in traditional medicine practice.27 The phytochemical contents and proximate composition as well as the medicinal usefulness of B. coriacea have been reported elsewhere.27,28,29,30,31 Sphenostylis stenocarpa is commonly referred to as African yam bean. The nutraceutical usefulness of the African yam bean is associated with its antioxidant and low hepatotoxic properties.32,33 Furthermore, Ndidi et al.34 reported the proximate, antinutrients and mineral composition of raw and processed African yam bean. Studies have shown that CCl4 infusion or inhalation elicits chemical-induced multiple organ lesions such as fibrosis, cirrhosis and hepatocarcinoma,12,13,35,36 and by extension, renal dysfunction in animal models.5,6,12 Organ lesion and ensuing pathology elicit wide variations in concentrations of metabolites and elevation of non-functional plasma enzymes in blood samples of experimental animals. Specifically, because plasma lipoproteins, for the most part, are biosynthesized in the hepatocytes, chemical and biotic agents that impact negatively on liver functional integrity distort plasma lipid patterns.2,37,38 Serum lipid profile (SLP) describes the propensity to developing atherogenic plaque.2,39 Accordingly, functional assessments of hepatic and renal tissues, using blood indicators in conjunction with inspection of tissue morphology and integrity tests using histopathological techniques, describe the level of chemical-induced organ lesions and measure of success of therapeutic interventions. There are growing interests in the quest for multi-dimensional applications of herbs; particularly those commonly used among traditional herbal medicine practitioners, for the alleviation of pathologic conditions.13,17,40 Thus, ethno-botanical bio-prospecting offers another strategy for new herbal remedy discoveries, including those used for alleviation of co-existing liver and kidney pathologic conditions. Additionally, in ethno-medicinal practices, herbs are either administered raw or subjected to hydrothermal processing prior to their application. The present study sought to ascertain the functional integrity of hepatic and renal tissues, concurrently with blood lipid patterns, of Wistar rats infused with CCl4 and treated with raw and hydrothermal processed Nigerian indigenous herbs, namely, M. myristica, C. odorata, B. coriacea and S. stenocarpa. High-grade raw seeds of M. myristica, B. coriacea and S. stenocarpa were purchased from Relief and Obazu-Mbieri Markets located in Owerri Capital Territory, Imo State, Nigeria. Fresh leaves of C. odorata were harvested from a private garden in Amakihia, Owerri-North Local Government Area, and Imo State, Nigeria. The samples were transported to the laboratory, identified and authenticated by Dr. E.S. Willie at the Herbarium of the Department of Agronomy, Michael Okpara University of Agriculture, Umudike, Abia State, Nigeria. All samples were collected between the months of February and March, 2015. Voucher specimens were deposited at the Herbarium for reference purposes. Appropriate separate quantities of Group R samples were pulverized using Thomas-Willey milling machine (ASTM D-3182, India). The ground samples were transferred into corresponding vacuum desiccators and allowed to dry at laboratory ambient temperature until a constant weight was achieved. Appropriate separate quantities of Group H samples were boiled in distilled water in corresponding conical flasks (sample/water ratio = 1:4 w/v). According to local traditional medicine practice, hydrothermal processing of the seed samples was in the following durations: M. myristica = 10 min, B. coriacea = 1 h and S. stenocarpa = 1.5 h, whereas leaves of C. odorata were subjected to hydrothermal processing for 5 min. Next, the Group H samples were dried separately in an oven (Gallenkamp Oven 300 plus series, England) at 50°C until a constant weight was achieved. Finally, Group H samples were ground using the Thomas-Willey milling machine (ASTM D-3182; India), after which the samples were stored in separate air-tight plastic bottles with screw caps pending extraction. Extract R1; Raw seeds of M. myristica = 8.94% (w/w). Extract R2; Raw leaves of C. odorata = 6.22% (w/w). Extract R3; Raw seeds of B. coriacea = 8.07% (w/w). Extract R4; Raw seeds of S. stenocarpa = 14.02% (w/w). Extract H1; Hydrothermal processed seeds of M. myristica = 6.41% (w/w). Extract H2; Hydrothermal processed leaves of C. odorata = 4.39% (w/w). Extract H3; Hydrothermal processed seeds of B. coriacea = 7.12% (w/w). Extract H4; Hydrothermal processed seeds of S. stenocarpa = 13.51% (w/w). Portions of the each extract was measured for phytochemical contents. Also, the each extract was reconstituted in phosphate buffered saline (PBS) solution that was osmotically equivalent to 100 g/L PBS (90.0 g NaCl, 17.0 Na2HPO4.2H2O and 2.43 g NaH2PO4.2H2O) and an appropriate dose was administered to corresponding experimental animals. Healthy male Wistar rats (90 days old) weighing between 150-260 g were maintained at laboratory ambient temperature of 30–55% relative humidity on a 12-h light/12-h dark cycle, with access to water and standard commercial feeds (SCF) (Ewu Feed Mill, Edo State, Nigeria) ad libitum, for 2 weeks acclimatization period. The Institutional Review Board of the Department of Biochemistry, Federal University of Technology, Owerri, Nigeria, granted approval for this study. The care and handling of the animals conformed to the standard principles of laboratory animal care of the United States National Institutes of Health (NIH, 1978). Group 1: Normal rats received SCF + water ad libitum + PBS. Group 2: Normal rats received SCF + water ad libitum + paraffin oil. Group 3: Fibrotic rats received SCF + water ad libitum + CCl4/paraffin oil mixture. Group 4: Fibrotic rats received SCF + water ad libitum + silymarin. Group 5: Fibrotic rats received SCF + water ad libitum + Extract R1. Group 6: Fibrotic rats received SCF + water ad libitum + Extract R2. Group 7: Fibrotic rats received SCF + water ad libitum + Extract R3. Group 8: Fibrotic rats received SCF + water ad libitum + Extract R4. Group 9: Fibrotic rats received SCF + water ad libitum + Extract H1. Group 10: Fibrotic rats received SCF + water ad libitum + Extract H2. Group 11: Fibrotic rats received SCF + water ad libitum + Extract H3. Group 12: Fibrotic rats received SCF + water ad libitum + Extract H4. At the end of the feeding and treatment period, the rats were subjected to fasting for 12 h, after which the animals were sacrificed and blood samples were drawn from the orbital sinus47 and measured for serum biomolecules of interest. Autopsy samples of the renal and hepatic tissues were excised for histopathological examinations. Organ histology was according to the methods described by Banchroft et al.59 as previously reported.15,60 Autopsy samples of the renal and hepatic tissues of the different animal groups, fixed in 10% formolsaline (pH = 7.2) for 24 h and washed with continuous flow of distilled water. The specimens were cleared in xylene embedded in paraffin in hot air oven at 56°C for 24 h. Paraffin bees wax tissue blocks were prepared for sectioning at 4-mm thickness using a semi-automated rotatory microtome. The obtained tissue sections were collected on glass slides, dehydrated by immersing in serial dilutions of ethyl alcohol-water mixture, cleaned in xylene and embedded in paraffin wax. Next, the specimens were deparaffinized and stained with hematoxylin and eosin (H&E) dye for histopathological examinations. Photomicrographs of the tissue sections were captured using chare-couple device (CCD) camera under light microscope (Olympus BX51TF; Olympus Corporation, Tokyo, Japan) at × 400 magnification power. The data were analyzed by the analysis of variance procedure while treatment means were separated by the least significance difference (LSD) incorporated in the statistical analysis system (SAS) package of 9.1 version, (2006). Table 1 showed that the concentrations of alkaloids in the four herbal extracts were within the range of 4.83 ± 0.03 – 31.33 ± 0.29 mg/100 g sample, in which Extract R1 gave the highest concentration of alkaloids. The concentration of alkaloids in Extract R2 was approximately 1.9 fold lower than that of Extract R1; p < 0.05. Furthermore, the concentration of alkaloids in Extract R3 was 2.36 folds lower than that of Extract R2; p < 0.05. The Extract R4 gave the lowest concentration of alkaloids and was not significantly different (p > 0.05) from that of Extract R3. The concentration of alkaloids in Extract H1 was significantly different (p < 0.05) from that of Extract H2. Conversely, the concentration of alkaloids in Extract H3 was not significantly different (p > 0.05) from that of Extract H4. The concentrations of alkaloids in Extract H3 and Extract H4 were significantly different (p < 0.05) from those of Extract H1 and Extract H2. An overview of Table 1 showed that the concentrations of alkaloids in Extracts (R1-R4) were significantly higher (p < 0.05) than those of Extracts (H1-H4), except the corresponding concentrations of alkaloids between Extract R4 and Extract H4; p > 0.05. Table 1 showed that Extract R2 gave the highest concentration of flavonoids, which was significantly different (p < 0.05) from that of Extract R1. The concentrations of flavonoids in Extract R3 and Extract R4 showed no significant difference (p > 0.05). In a corresponding manner, the concentration of flavonoids in Extract H2 was significantly higher (p < 0.05) than that of Extract H1. Likewise, the concentration of flavonoids in Extract H3 was not significantly different (p > 0.05) from that of Extract H4. An overview of Table 1 showed that the concentrations of flavonoids in Extracts (R1-R4) were significantly higher (p < 0.05) than those of Extracts (H1-H4), except the corresponding concentrations of flavonoids in Extract R3 and Extract H3 as well as Extract R4 and Extract H4. The concentration of tannins in Extract R1 was not significantly different (p > 0.05) from that of Extract R2. However, the concentration of tannins in Extract R3 was 1.79 fold lower than that of Extract R1; p < 0.05. The Extract R4 gave marginal higher concentration of tannins than that of Extract R3; p > 0.05. Table 1 showed that the concentrations of tannins in Extracts (H1-H4) were significantly lower (p < 0.05) than their corresponding Extracts (R1-R4). Additionally, the concentrations of tannins in Extracts (H1-H4) was within a relatively narrow range of 0.42 ± 0.01 – 0.62 ± 0.01 mg/100 g dry sample; p > 0.05. The concentrations of saponins in the herbal extracts varied within a relatively narrow range: 0.33 ± 0.09 – 4.33 ± 0.02 mg/100 g dry sample; p > 0.05. Although the concentrations of saponins in Extracts (R1-R4) were comparatively higher than those of Extracts (H1-H4), the values showed no corresponding significant difference (p > 0.05). Finally, a general survey of Table 1 showed that the concentrations of the phytochemicals analyzed in the raw and hydrothermal processed herbs were in the order: alkaloids > flavonoids > tannins > saponins. Serum ALT activity of Group 1 was not significantly different (p > 0.05) from that of Group 2 (Figure 1). However, Group 3 exhibited comparatively raised level of serum ALT activity, which represented 4.44 folds increase in the enzyme activity compared with that of Group 1; p < 0.05. Conversely, serum ALT activities of Groups (4-12) were significantly lower (p < 0.05) than that of Group 3, but significantly higher (p < 0.05) than those of Group 1 and Group 2. Specifically, serum ALT activities of Group 6, Group 10, Group 11 and Group 12 were significantly higher (p < 0.05) than that of group 4, whereas serum ALT activities of Group 5, Group 7, Group 8 and Group 9 were comparable with that of Group 4; p > 0.05. Serum AST activities of the various experimental rat groups followed the same pattern with their serum ALT activities (Figure 1). However, the activity ratios of AST to ALT of the various experimental rat groups were generally less than 1.0 unit. Serum ALP activity of Group 1 was not significantly different (p > 0.05) from that of Group 2 (Figure 1). Serum ALP from Group 3 gave the highest activity, which was significantly different (p < 0.05) from other experimental rat groups. Additionally, serum ALP activity of Group 3 was comparable with those of Group 5, Group 6 and Group 10 (p > 0.05), whereas serum ALP activities of Group 7, Group 8, Group 9, Group 11 and Group 12 were significantly higher (p < 0.05) than that of Group 3. Figure 2 showed that serum TBCs of Group 1 and Group 2 were less than 1.0 mg/mL and showed no significant difference (p > 0.05). Contrary, serum TBCs of other experimental groups, except Group 11, were above 1.0 mg/dL. Specifically, Group 3 gave the highest serum TBC, which was significantly different (p < 0.05) from other experimental rat groups. Furthermore, serum TBC of Group 11 was comparable with those of Group 4, Group 7, Group 9 and Group 12; p > 0.05. Figure 3 showed that serum TPC of Group 1 was not significantly different (p > 0.05) from that of Group 2. Additionally, serum TPCs of Group 4, Group 5, Group 6, Group 7 and Group 10 were comparable; p > 0.05. Likewise, serum TPCs of Group 11 and Group 12 were comparable with that of Group 2; p > 0.05. However, serum TPC of Group 3 was significantly lower than other experimental rat groups; p < 0.05. Figure 3 showed that serum AlCs of the various experimental rat groups exhibited similar pattern with serum TPCs, exemplified by the fairly strong correlation coefficient (r = 0.651662) between their serum TPCs and serum AlCs. Some phytochemical contents of raw and hydrothermal processed herbal extracts. The mean (X) ± S.D of six (n = 6) determinations. Means in the column with the same letter are not significantly different at p > 0.05 according to LSD. * Concentrations of saponins showed no significant difference p > 0.05 according to LSD. Figure 4 showed that serum CrCs and serum UrCs of Group 1 and Group 2 did not show significant difference (p > 0.05). Conversely, serum CrC of Group 3 was significantly higher (p < 0.05) than those of Group 1 and Group 2. Additionally, serum CrC of Groups (4-12) varied within a narrow range of 0.61 ± 0.03 – 0.66 ± 0.05 mg/dL; p > 0.05. Serum UrC of Group 3 significantly higher (p < 0.05) than those of Group 1 and Group 2 as well as other experimental rat groups- Groups (5-12). The correlation coefficient (r = 0.898134) between serum CrC and serum UrC of the experimental rat groups indicated a strong positive correlation. Figure 5 showed that SLP of Group 1 exhibited comparable pattern with that of Group 2 as typified by their atherogenic indices (Table 2). Specifically, serum TC, TAG and LDL-C concentrations of Group 3 were significantly raised (p < 0.05) compared with Group 1 and Group 2. Conversely, Group 3 exhibited the lowest serum HDL-C concentration compared with other experimental rat groups. Generally, serum TC, TAG and LDL-C concentrations of Groups (5-12) were higher than that of Group 4, and in turn, those of Group 4 was higher than those of Group 1 and Group 2; p < 0.05. An overview of Table 2 showed that atherogenic indices of Group 1 and Group 2 were below the critical values, whereas those of Groups (3-12) were within the following ranges: TAG/HDL-C ratio (3.59 ± 0.03 – 6.76 ± 0.06), TC/HDL-C ratio (3.72 ± 0.02 – 6.94 ± 0.05) and LDL-C/HDL-C ratio (2.00 ± 0.01 – 4.59 ± 0.02). The histopathological features of hepatic tissue sections of the experimental rat groups are presented in Figure 6. Photomicrograph section of hepatic tissues of Group 1 showed normal histology and was comparable with that of Group 4; except for slight localized distortion in hepatic parenchyma of Group 4. Additionally, hepatic section of Group 2 showed normal histology with minimal cytoplasmic vacuolization. Conversely, hepatic section of Group 3 showed evidence of massive disarrangement and distortions of tissue architecture, accompanied with infiltration of fatty deposits as well as centrilobular necrosis comparable with that of Group 5. 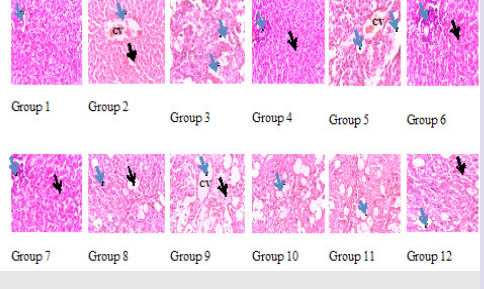 Figure 6 showed that hepatic sections of Group 8, Group 9, Group 10, Group 11 and Group 12 showed evidence of fatty deposits and fibrotic changes of hepatic parenchyma. Specifically, hepatic tissues sections of Group 9 and Group 10 were also associated with cytoplasmic vacuolization. Atherogenic indices of experimental rat groups. Serum aspartate aminotransferase, alanine aminotransferase and alkaline phosphatase activities of experimental rat groups. Serum total bilirubin concentration of experimental rat groups. Serum total protein and albumin concentrations of experimental rat groups. The histopathological features of renal tissue sections of the experimental rat groups are presented in Figure 7. Photomicrograph section of renal tissues of Group 1 showed normal histology, which was comparable with that of Group 2. The tubular and glomeruli configurations were absent in renal tissues of Group 3, whereas those of Group 4 and Group 5 were present but distorted. Renal tissue section of Group 6 showed evidence of parenchyma necrosis with distorted glomeruli architecture. The degenerated and distorted tubular morphology of renal tissues of Group 7 was comparable with that of Group 11. There were evidence of infiltrated mononuclear cells around the glomeruli (Group 8, Group 9 and Group 11) and dispersed in renal parenchyma (Group 10). Serum creatinine and urea concentrations of experimental rat groups. Serum lipid profile of experimental rat groups. Photomicrograph sections of hepatic tissues (H&E x400); Group 1: Normal histology showing normal central vein (blue arrow). Group 2: Normal histology showing pronounced normal central vein (CV) (blue arrow) and Kupffer cells along the sinusoids (black arrow). Group 3: Massive tissue necrosis and fibrotic changes of hepatic parenchyma with centri-lobular vacuolization and extensive fatty deposits (blue arrows). Group 4: Localized minimal distortion of hepatic parenchyma architecture (blue arrow) with infiltration of mononuclear cells around portal area and adjoining hepatic tissues (black arrows). Group 5: Massive tissue necrosis and fibrotic changes of hepatic parenchyma with extensive fatty deposits (blue arrows). Group 6 and Group 7: Localized minimal distortion of tissue architecture (blue arrow) with massive number of apoptotic hepatocytes (black arrow). Group 8: Fibrotic changes (blue arrow) with fatty deposits (black arrow). Group 9: Fibrotic changes with fatty deposits (black arrow) as well as CV congestion (blue arrow). Group 10: Fibrotic changes with fatty deposits (blue arrow). Group 11: Fibrotic changes of hepatic parenchyma with fatty deposits (blue arrow). Group 12: Fibrotic changes with fatty deposits (blue arrow) with cytoplasmic vacuolization (black arrow). Photomicrograph sections of renal tissues (H&E ×400). Group 1 and Group 2: Normal histology showing normal tubular and glomeruli architecture. Group 3: Pronounced degenerated and distorted tubular and glomeruli architecture as well as evidence of distorted renal parenchyma integrity (blue arrow). Group 4 and Group 5: Minor distorted glomeruli architecture and infiltrated mononuclear cells around the glomeruli (blue arrow). Group 6: Distorted tubular and glomeruli architecture as well as necrosis of renal parenchyma. Group 7: Minor distorted glomeruli architecture but degenerated and distorted tubular morphology. Group 8 and Group 9: Major distorted glomeruli architecture and infiltration of mononuclear cells around the glomeruli (blue arrow). Group 10: Dispersed mononuclear cells around the glomeruli and renal parenchyma. Group 11: Minor distorted glomeruli architecture and infiltrated mononuclear cells around the glomeruli (blue arrows). Group 12: Normal glomeruli architecture but degenerated and distorted tubular morphology. Measurements of hepatic enzymes in serum of animal models have been used in previous studies as basis for ascertaining the capacities of herbal remedies to ameliorate chemically induced liver damage.8,9,86,87,88 Elevated levels of serum AST, ALT and ALP activities are diagnostic of fibrotic changes of the liver, myocardial infarction, bone disorders and other related pathologic conditions associated with organ necrosis.89 Serum ALT activity is more specific for hepatic injury than an increase in serum AST activity and may reflect fatty changes in the liver as in the case of non-alcoholic fatty liver disease (NAFLD).90-93 Specifically, the raised level of serum ALT activity of Group 3 (Figure 1) was obvious indication of fibrotic changes of hepatic tissues of the experimental rats as corroborated in previous findings.12,13,94 However, fibrotic rats treated with raw and hydrothermal processed herbs showed evidence of amelioration of CCl4-induced liver injury as indicated by their comparatively lower serum ALT activities, which concurred with previous findings.13,77,94,95 The present findings showed that the capacities of the raw and hydrothermal processed herbs to reverse elevated levels of serum AST and ALT activities were comparable with that of silymarin, which was used as reference treatment of fibrotic rats. Furthermore, it appeared that the raw herbs exhibited greater capacities to lower serum ALT activities of fibrotic rats than those of corresponding hydrothermal processed herbs, which was an indication of greater capacities of the raw herbs to ameliorate CCl4-in-duced liver injury than those of corresponding hydrothermal processed herbs. Likewise raised level of serum ALP activity of Group 3 was a reflection of hepatobiliary disorder and fibrosis,87 which paralleled the patterns of serum AST and ALT activities of other experimental rat groups and conformed with the outcome of related investigations.1,12,13,45,96 Overall, serum AST, ALT and ALP activities of fibrotic rats treated with raw and hydrothermal processed herbs as well as the standard herbal drug-silymarin were profoundly higher those of normal rat groups (Group 1 and Group 2), which by implication showed that the various herbal remedies did not possess the capacities to offer full therapeutic benefits within the experimental 28 days of treatment. The factors that elicit raised level of bilirubin in serum are multifaceted and serum bilirubin concentration greater than 1.0 mg/dL is diagnostic of hyperbilirubinemia.97,98 Hyperbilirubinemia occurs due to rapid haemolysis such that the production of bilirubin far exceeds the capacity of normal hepatocytes to conjugate and excrete bilirubin. In the event of hepatic damage, the capacities of the hepatocytes to conjugate and excrete bilirubin are compromised, even when bilirubin is produced in normal quantities. Furthermore, hepatobiliary obstruction prevents the excretion of bilirubin engendering the accumulation of bilirubin in the liver, which eventually diffuses into the blood system. Previous studies have noted that reactive CCl3•− and Cl3COO•− radicals generated from CCl4 metabolism promoted membrane lipid peroxidation, in which the erythrocytes99 and hepatorenal tissues were vulnerable1,9,11-14 and consequently, prompted rapid haemolysis and hepatic necrosis with attendant hyperbilirubinemia in the experimental rats (Groups 3-12). The results of the present study (Figure 2) indicated that fibrotic rats, regardless of the type of herbal treatment administered, presented evidence of hyperbilirubinemia. However, the hydrothermal processed herbs appeared to exhibit relatively higher tendencies to lower the severity of hyperbilirubinemia than those of corresponding raw herbs. In that regard, the results appeared to suggest that hydrothermal processing of the herbs caused the elimination or reduction in the amount of cytotoxic components in the herbs that probably interfered with the capacity of the herbs to ameliorate hyperbilirubinemia. The plasma proteins (e.g. albumin) are synthesized by the liver and therefore low circulating level of plasma proteins indicates hepatic dysfunction. Previous studies have shown that mild perturbation of hepatic tissues integrity did not profoundly affect the capacity of the liver to bio-synthesize plasma proteins.58,100 The present study showed that serum total protein and albumin concentrations of Group 3 were lower than those of Group 1 and Group 2 (Figure 3), which confirmed compromised hepatic function. However, the administration of raw and hydrothermal processed herbs caused limited improvement in the capacity of hepatocytes of fibrotic rats to biosynthesize plasma proteins. The renal tissues are primarily concerned with the clearance of nitrogenous waste products and other blood low threshold substances. Creatinine is mainly the catabolic waste product from tissue protein turnover, whereas urea is derived from oxidative deamination of dietary amino acids.1,101,102 Elevated blood creatinine and urea concentrations are diagnostic of impaired renal function. The present study showed evidence of renal dysfunction following infusion of the experimental rats with CCl4, exemplified by comparatively raised serum creatinine and urea concentrations of Group 3 (Figure 4). The present findings confirmed previous research outcomes, which noted that acute chemical intoxication that caused morphological and functional damages to hepatic tissues predisposed animal models to developing acute renal dysfunction.1,5,6,8,9 Fibrotic rats treated with raw and hydrothermal processed herbs showed evidence of limited amelioration of impaired renal function, typified by their lowered serum creatinine and urea concentrations compared to that of Group 3. In a related study, Elgazar and AboRaya,103 using serum urea and creatinine concentrations as biomarkers, noted that single and combinatorial formulations of Petroselinum sativum, Eruca sativa and Curcuma longa ameliorated gentamicin-induced renal tubular necrosis in adult male Sprague Dawley rats. The massive disarrangement of hepatic tissues architecture of untreated fibrotic rats (Group 3) correlated with the levels of alterations of serum indicators, namely, serum ALT, AST and ALP activities as well as serum TBC as previously described.12,13,98,99 Additionally, photomicrograph section of hepatic tissues of fibrotic rats (Figure 6) revealed and confirmed CCl4-induced necrosis and steatosis as previously described.12,13,88,106 The localized distortions in hepatic architecture, persistence of hepatic steatosis and hydropic degenerations in fibrotic rats following treatment with raw and hydrothermal processed herbs were indications, which confirmed limited capacities of the herbs to ameliorate CCl4-induced morphological and functional impairments of hepatic tissues within the experimental period of 28 days. According to Sokol et al.107 manifestation of hepatic steatosis was as a result of low availability of tissue a-tocopherol and ascorbic acid, rather than glutathione (GSH), which also predisposed the liver to oxidative injuries as exemplified by the presence of hepatic necrosis in tissue sections of the present report. Rincón et al.5 suggested that the effect of CCl4 on kidney tissue morphology and function depended on the functional state of the liver. Similar to the histopathological status of the liver, photomicrograph sections of renal tissues (Figure 7) showed that the distortions in renal tissue architecture correlated with the levels of alterations in their blood indicators; serum creatinine and urea concentrations as previously described.60 Furthermore, the tissue architecture of fibrotic rats administered with raw and hydrothermal processed herbs confirmed the limited capacities of the herbs to ameliorate renal dysfunction within the experimental period of 28 days. The losses in phytochemical contents following hydrothermal processing of the herbs did not substantially affect their overall therapeutic scores against morphological and functional impairments of hepatic and renal tissues following CCl4 intoxication of the experimental rats. However, herbal intervention against CCl4-induced hyperbilirubinemia showed that hydrothermal processed herbs possessed greater capacity to lower the severity of hyperbilirubinemia than their corresponding raw herbs. Nevertheless, a more rewarding bio-prospecting exercise for the alleviation of CCl4-induced hepatorenal impairment could be achieved by subjecting the herbs to a sequential multi-solvent extraction process, which perhaps, will provide improved and better therapeutic benefits than the present outcomes. The authors are grateful for the technical assistance offered by Dr. E.S. Willie of the Department of Agronomy, Michael Okpara University of Agriculture, Umudike, Abia State, Nigeria. Dr. Paul C Chikezie Ph.D. Medical Biochemistry Department of Biochemistry, Imo State University, Owerri, Nigeria. Professor Okey A Ojiako Ph.D. Medical Biochemistry Department of Biochemistry, Federal University of Technology, Owerri, Nigeria. Dr. Chiedozie O Ibegbulem Ph.D. Nutritional Biochemistry/Toxicology Department of Biochemistry, Federal University of Technology, Owerri, Nigeria. Professor Reginald N Nwaoguikpe Ph.D. Biochemical Pharmacology/Toxicology Department of Biochemistry, Federal University of Technology, Owerri, Nigeria.